Australian Seaweed Institute is spearheading industry development through collaboration with growers, researchers, businesses and government to create a model for sustainable ocean aquaculture and, in parallel, develop the market for the end products and research programs needed to position Australia as a global leader. 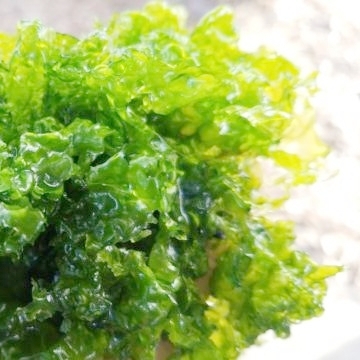 With an initial launch into the food market, The Australian Seaweed Institute’s product will be export ready and closely followed by seaweed products for use in nutraceuticals, bio plastics, animal feed and fertiliser. Native Australian seaweeds are delicious eaten raw or added to salads and soups. Seaweed is a superfood packed with a multitude of macro and micronutrients such as omega-3, iodine, protein and fibre. Seaweed skincare has grown exponentially and it’s no surprise given its high concentration of vitamins, minerals, amino acids and antioxidants. Seaweed products are famous for their anti-aging and calming anti-inflammatory benefits. It’s ability to regenerate itself at high rates makes for a powerful skin renewal ingredient, while also providing high doses of moisture. With huge potential to replace plastic packaging, seaweed bio plastics are 100% biodegradable and are tasteless and odourless. Products include water wraps (shown), printable food wrappings, tea and coffee sachets, dry seasoning sachet, and soap packaging... to name just a few! Feeding cows seaweed has shown to slash greenhouse gases, according to the CSIRO. Just a small amount of marine algae added to cattle food reduces methane emissions from cattle gut microbes by as much as 99 per cent.